Traditional insurance and healthshares have the same purpose: helping people get the medical treatments they need. However, they function and are regulated very differently. Here’s a brief overview of a few differences. Premiums vary depending on what insurance you have. According to CNBC’s website, the annual cost of insurance for the average American in 2016 was $10,345. Since then the cost has gone up at least another 50%. To put that into perspective, in 1960, the cost was $146 per person, nearly nine times less than the cost today. The cost of traditional insurance has skyrocketed over the last fifty years. 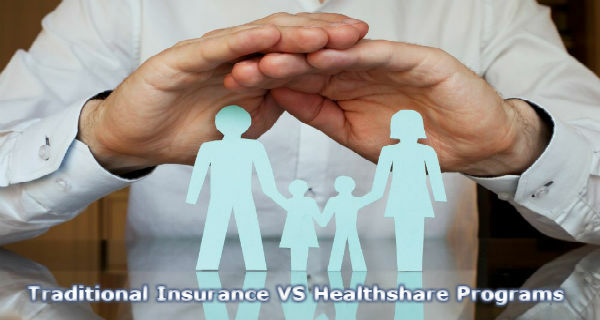 There are no premiums with healthshares. However, members do pay a monthly amount—a share—based on age and number of people in the household. The money is paid into a collective pot, which is then used to pay for members’ qualifying medical expenses. The monthly amount tends to be significantly cheaper than traditional insurance. Take Aliera healthshare programs. Single individuals under 30 pay around $143 a month. Just like premiums, deductibles vary depending on what insurance you have. According to eHealth’s website, the average deductible for individual plans was $4,328, with the average family plan at $8,352. There are no deductibles. Instead, members have an annual household portion, which can range from $500 to $10,000. The annual household portion must be met before bills can be shared for the household, then all qualifying medical expenses are shared. Since insurance is government regulated, and church and state are separate, traditional insurance is not faith-based and overall non-secular. Healthshares are not government regulated. Instead, they’re regulated by health care sharing ministries. Because of this, some organizations are, in fact, faith-based and some even require members to sign a statement of faith and even regular church attendance. Not all of them are faith-based, however. Plans vary depending on the state you live in and choice of network providers might be limited. However, coverage tends to be fairly comprehensive. Plans are not comprehensive. In fact, there tends to be annual or lifetime caps on the amount of coverage available for each member. While this is a drawback for some, there tends to be more choice in terms of network providers and primary care physicians.